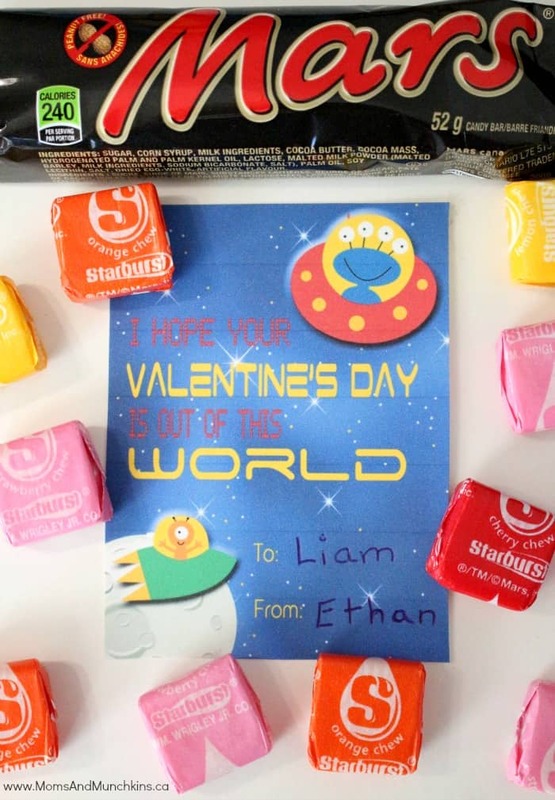 There are so many cute ideas for Valentine’s Day out there but these are out of this world – Alien Valentines! Perfect for little boys to hand out to their friends. Fill the treat bags with space-themed candy like Mars bars, Milky Way bars, Starburst Candy or star-shaped treats. We have some fun non-candy ideas below as well. Do your kids hand out Valentine’s to the entire class or is this a tradition they have outside of school? My son isn’t in school yet so we pack up fun treat bags to deliver to his friends. The fabulous Alyssa of Just A Little Sparkle created these for you to download for free! Looking for non-candy treats? Some fun ideas include little green alien men, glow in the dark play dough, glow sticks, and glow in the dark stickers. These Alien Valentines are available for FREE for our monthly newsletter subscribers! Signing up is free & easy – we have over 5400 subscribers! Simply enter your email address, confirm your subscription, and you’ll be directed to a page with a link to the freebies page along with the secret password. This link and password will also be repeated in each of the monthly newsletters. We’d like to send a big THANK YOU to our new monthly newsletter printables designer – Alyssa of Just A Little Sparkle. On Alyssa’s blog you’ll find plenty of party inspiration for all of life’s celebrations. Her printable designs are sure to add Just A Little Sparkle to your next event. Visit our Valentine’s Day page for even more free printables, Valentine’s Day games, party ideas, sweet treats and so much more! We love any reason for a party! We’re always adding new ideas for holidays and family fun. Never miss an update by following us on Facebook, Twitter, Pinterest, Google + and Bloglovin’.